A couple of weeks ago, I went out to dinner at a Turkish restaurant on the East Side of Manhattan. There were nine of us celebrating the birthday of a mother/grandmother/aunt who was turning 87. We were hungry and thirsty, so cocktails were ordered, a couple of bottles of wine were drunk, five or six appetizers studded the table, four different types of salad appeared, and everybody ordered an entree. We were stuffed to the brim before the main course was served, but we couldn’t resist devouring every morsel because the food was delicious. We allowed about five minutes to pass so we could digest, and decided it was time to bring out the vanilla and chocolate Carvel ice cream cake that the birthday girl’s daughter had picked up. It’s her Mom’s favorite. The waiter came over, and promptly announced that the restaurant charged $2.50 per person to serve the cake. 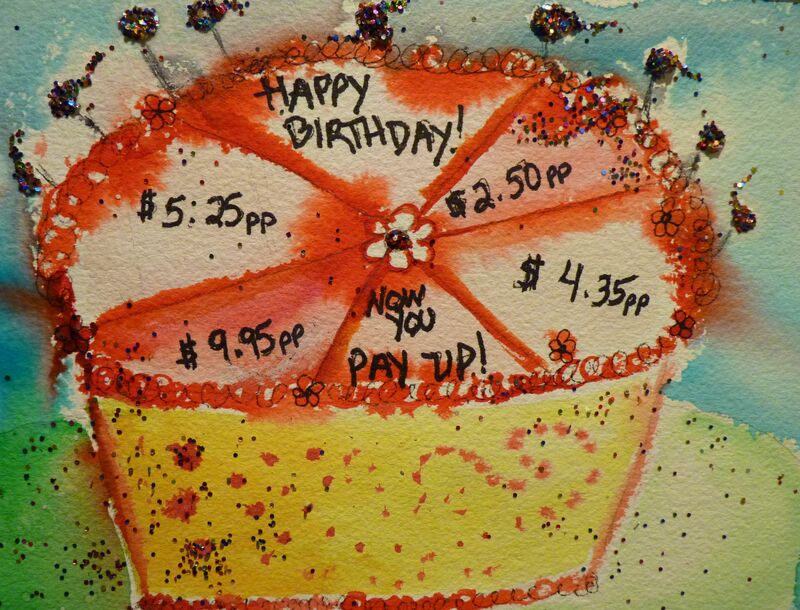 Like corkage charges for opening a bottle of wine, the restaurant industry has adopted the phenomenon of a “cakeage” fee. I was clueless, but what I gathered from the other dinner guests is that this has become a well-known and common practice. So common that it is accepted with a sigh.This was not my immediate reaction. Baklava- very thin layers of dough with walnuts in between layers. Kadayif -shredded wheat with pistachios soaked in syrup. Kayisi -poached apricots stuffed with whole almonds and turkish heavy cream. Keskul -almond pudding made with milk and cracked almonds. Kunefe -shredded wheat with pistachios and cheese soaked in syrup. Revani -semolina-based pistachio cake soaked in honey syrup. Sutlac -baked rice pudding made with milk, rice, and sugar. Now, really! If you want the look and feel of a simulated party with birthday cake do you want to put a candle in some pistachio-studded shredded wheat? I am sure every option is yummy, but they sound like breakfast foods- absolutely not fitting for a someone who was born in 1926! I acknowledge that $2.50 is not an excessive amount to charge especially since online research reveals that some restaurants charge $10.00 per person for a “cakeage” fee. So the fact that an additional $22.50, plus the standard city tax of 8% would have increased the bill by $25.00 is hardly worth getting upset over. But what is awful, at least in the opinion of my right-sided, 50-year-old soul, is the idea that after wining and dining in a convivial setting where you have willingly, and joyfully, overpaid for cocktails and wine, and are aware that an 18% tip will be automatically applied to the bill, the restaurant has the nerve to feel justified in charging a fee for slicing a birthday cake. It just feels like unnecessary gouging. But that’s that’s life in 2013. We pay to have our baggage put on and off the plane. We pay to get two more inches of legroom once seated in the plane, and we pay for food to be served to us halfway through the flight. These small amenities used to be standard, but the “Pay for It Plan” has been so successful that the hotel industry is jumping on the bandwagon. A recent article in The New York Times reported that hotel management has devised a fee for checking out early. Excuse me? The joy and pleasure of my hard-earned vacation dollars are being ruled by whether I have to pay $20 because I decide to drive to the Rocky Mountains on Saturday instead of Sunday? You’ve got to be kidding me. It may only be $20 but it’s the relentless constant inch-by-inch movement in this direction, and the attitude that we will pay because we have no choice. In any case, it is nice to remember that we once lived in a world where the philosophy of good business was in the offering of a lagniappe. I love baklava! I hope if I live to be 83 they will serve it at my birthday party. Give that crooked restaurant a one star review on Yelp and make sure you tell everyone you know never to eat there. Avoid the “House of Crooks”! Long term they will lose money on ripoff fees when customers do not return!